Aisling McPolin along with her son Noel McPolin presents a cheque to Seamus McCabe PIPS Newry & Mourne, the first cheque presentation on PIPS Newry & Mournes' new premises at 50 Mill Street Newry. Aisling is representing her mum and dad Noel and Bernie Kearney who recently celebrated their 40th Wedding Anniversary they asked guests to donate in lieu of gifts. 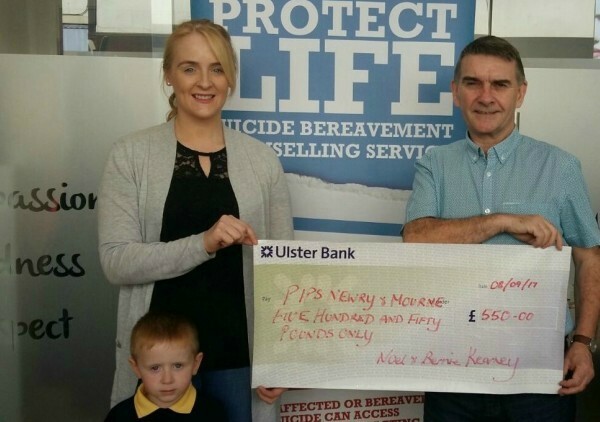 Noel and Bernie would like to thank all their family, friends and neighbours who donated so generously, the amount donated to PIPS Newry & Mourne was £550.00. PIPS Newry & Mourne would also like to thank all who donated on the night and a special thanks to Noel and Bernie for choosing us as their charity, we wish you both many more happy years together.